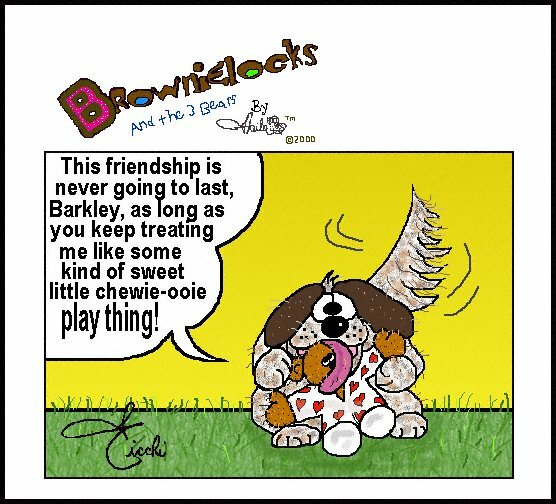 Westminster Dog Show History & Cartoon Fun by Brownielocks. Another dog cartoon we have is Beware of Dog! The event is officially known as "The Westminster Kennel Club Dog Show" and is a two-day event held on the second Monday and Tuesday in February in New York City. It is often referred to as the "World Series" or the "Super Bowl" of dog shows. It is also the second oldest continuously held sporting event in the United States. The Kentucky Derby is the oldest (See our page on the History of the Kentucky Derby.) by two years. The idea for an annual dog show in New York City originated from a group of men who raised sporting dogs and met occasionally at New York's Westminster Hotel. They decided to form the Westminster Kennel Club. On May 8, 9 & 10, 1877 the "First Annual New York Bench Show of Dogs" was held and featured more than 1,200 dogs. This was such a great success that they added a fourth day to the competition. By 1883 the show had found a permanent home at Madison Square Garden, where it has been held (with a few exceptions) ever since. After a while the show was cut back to three days and now to it's present two-day format. But, the Westminster Dog Show soon became and institution for dog fanciers across the United States. Since 1992, the entries ( 2,500) are limited to only American Kennel Club champions. These are dogs which have accumulated a certain number of points by winning at various other smaller dog shows. Prior to 2000, these 2,500 entries were first selected at random from all the mailed in entries and allowed to compete. However, after 2000, this system changed. Now the first 780 top dogs are sent special invitations and are allowed to compete representing the top 5 in each breed at American Kennel Club shows held during the preceding year. The remaining 1,720 dogs (making the total 2,500) competing are also quality dogs and top in points, but are not given a specific invitation. This ensures that only the very best of the best dogs in America get a chance to compete for the Westminster top honor, "Best in Show." In 2002, there were 159 different breeds represented. The top five breeds entered were: Dachshund, Irish Setter, Chinese Shar-pei, Australian Shepherd and Rotweiler. However, the Westminster Kennel Clubs logo uses a Pointer as it's dog representation. Why? This was based on a photograph of a dog named, Sensation, that was a famous pointer owned by the club who is said to have the most nearly perfect head of any dog in his breed at the time. The Westminster Dog Show gets a lot of media attention. Over 400 journalists from more than 20 countries. Many of whom are members of The Dog Writers Association of America. But what really made this event grow was when it began being televised in the early 1980's. Public interest then grew immensely. The show now attracts approximately 35,000 attendees and 4.6 million television viewers. The show also got a great boost in 2000 when the movie "Best in Show" came out starring Christopher Guest and Parker Posey. The Westminster Dog Show is called a "benched" show. This is because since 1983 they require that all the competitive dogs on a particular day must stay on their assigned benches throughout the judging procedure. This goes on for several hours! The exception is if the dog is being groomed or exercised. These benches are divided into separate areas for each dog by partitions. It's very crowded. Although this benching may make it easier on the judges, breeders and spectators to look at and talk about the dogs, this is a real strain on the dogs themselves to sit still and behave for such a long period of time. Presently, there are less than ten benched dog shows being held in the United States each year. This award has been given out since 1907. The owner of the dog that wins Best in Show receives a silver trophy from the Westminster Kennel Club. It is given to the dog who has received top honors from three separate judges: Judge of the Breed, Judge of the Group and Judge of the Best in Show Judge. In order to be the Best in Show Judge, you must have years of experience as a breed and group judge. And you must also have raised champion dogs in the past. Dogs are judged on their general appearance, condition and carriage, with special attention being paid to the dog's head (including the eyes, ears, skull and muzzle). The color and texture of the dog's coat is important. And it's hindquarters, forequarters, feet and tail are also judged. Also, the dog's temperament is a factor. Which type of dog has won Best in Show the most? The Wire fox terriers have won the most years, with the terrier group in general producing the most winners over any other group. In fact, the only dog to win Best in Show three times was a smooth fox terrier named Warren Remedy in 1907-1909. However, there have been other winners ranging from a 155-lb. Newfoundland to a 4-lb. Pomeranian. There is a week of social events prior to the show. But the day after the judging, the highlight is the Dog Fancier's Luncheon. This is held at Sardi's, the well-known and popular restaurant in Manhattan. This luncheon gives the judges the chance to talk to each other informally and compare their notes and decisions. At this luncheon, they also present the "Fido" awards as follows: Women of the Year, Man of the Year, Handler of the Year and Writer of the Year. And the guest of honor at this luncheon is the dog who won "Best in Show". This dog is reserved his own place of honor. This organization began in 1935 as a way of insuring that the journalists who cover dog shows were provided with the best facilities and equipment needed to do their jobs the best. The DWAA also holds an annual writing contest for both amateurs and professionals who write about the sport of raising, breeding and showing dogs (along with other aspects of dog ownership). The biggest night of the year for the dog writers is held on the Sunday evening before the Westminster Dog Show. The writing awards are presented to the winners. And writers from all over the country get to meet each other and discuss the next day's competition. Maximum of 20 points for= Body, Neck, Legs, Feet and Tail.